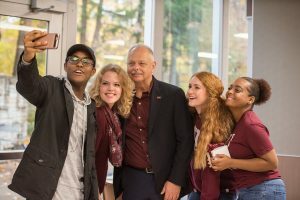 When I came to SIU, I didn’t expect to get my big break into show business. 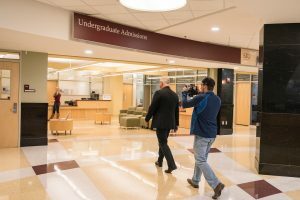 But here I am, starring in my very own video to help promote SIU’s Day of Giving, March 7. I don’t know that I am ready for Hollywood quite yet, but it may be time to start working on my IMDB page. While I wait for a call from Spielberg, I should take the time to thank everyone who helped me in my production career. 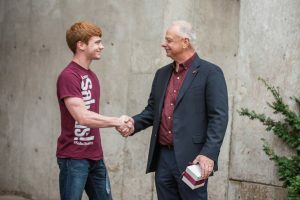 I continue to be amazed by the talent and dedication I see every day in the students, faculty and staff here at SIU. We started off the morning in the Admissions office. This scene opens the video, and I must say I was impressed with everyone in the office. Greg Wendt is standing in the forefront of this shot adjusting his camera. 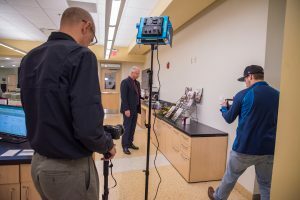 Greg is a video producer and instructional technology specialist at the Center for Teaching Excellence. To his right is videographer Steve Dew. I was impressed with their adaptability and professionalism right from the outset. Here we are at Admissions. What a unique experience to have someone always looking over my shoulder everywhere I went. The young woman in the photo is a senior who is majoring in civil engineering. Her name is Taylor Williams, and she told me that morning she just accepted a job with the Illinois Department of Transportation. Way to go, Taylor! This is one of my favorite shots, taken in the cafeteria of the Student Center. 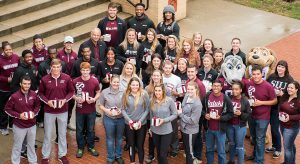 It humbles me to be in the midst of students whose futures shine so bright at SIU Carbondale. From left to right are Brad Brown, Josie Taylor, me, McKenzie Martin, and Nyah Addison. 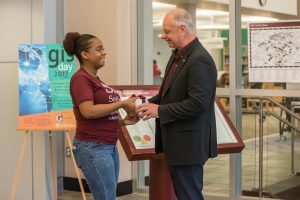 Here I am with Nyah Addison, a freshman business major and scholarship recipient from Chicago. Nyah’s (formerly) secret skill is sewing. She said she has been making clothes since she was 12 years old. 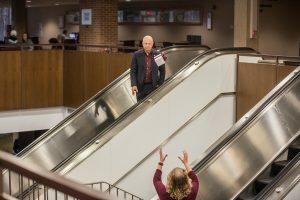 Here is where we had to work on my passing skills for the escalator scene. Kudos to student Josie Taylor who never missed a catch. Josie plans on majoring in zoology and would love to work in a zoo. Josie is a member of the social media team within University Communications. As we filmed, she was updating the university’s Instagram with photos from our video shoot. 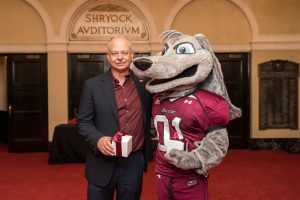 They say Grey Dawg never speaks, but in the time we shared together in Shryock Auditorium, he managed to whisper to me some pretty awesome Saluki stories. 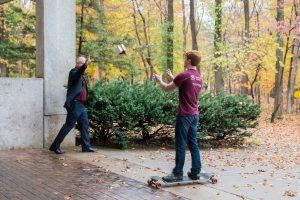 Here’s an action shot of me tossing a gift box to freshman Logan Jerolds as he passed by on a skateboard. Trust me, this is one of many takes we did to get the timing right. I think the end result was worth it. 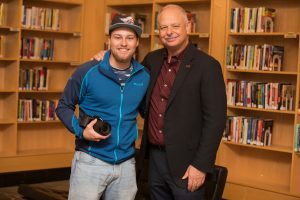 Logan is a shining example of an SIU student who has a clear vision of what he wants to accomplish. 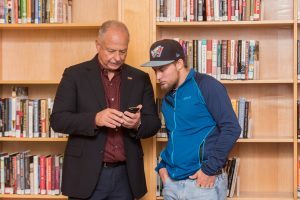 Logan shared that he has big dreams of traveling the world by using the foreign language skills he is learning at SIU to do international business. I love this shot. 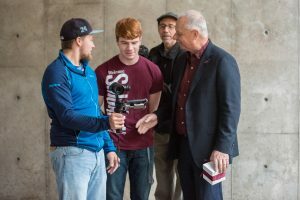 There’s Logan again in the center, while videographer Steve Dew, a 2017 SIU graduate, shows us all the footage of how the shot looked. This was a great bonding experience. This photo was taken after we wrapped the filming of the video at Morris Library. As we went through the day together, I discovered Steve and I share a love for adventure. Here I am showing Steve photos of my recent rock climbing experience. This is one of my favorite places to be on campus – the great Morris Library. 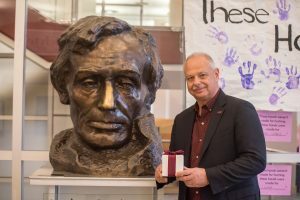 Here I am posing with the Lincoln statue. Here we are finishing up the production. I think it’s safe to say I made a new friend in one of our newest graduates. Thanks for your hard work, Steve! What a thrill it was to be in the midst of such talented students. While we endured a torrential downpour in the morning, the skies cleared just as Steve Dew got in the lift (thanks to the team at SIU’s physical plant!) to take this shot.